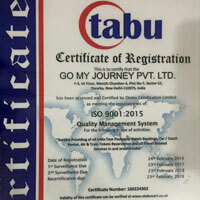 Go My Journey Pvt Ltd is one of the leading Travel Agents & Tour Operators from Delhi (India) and set-up in March 2005. We offer all India Tour Packages, Hotels Bookings, Car Rental, Air & Train Tickets Reservation and all Travel Related Services in all India. We are approved and active member with India Tourism Ministry. 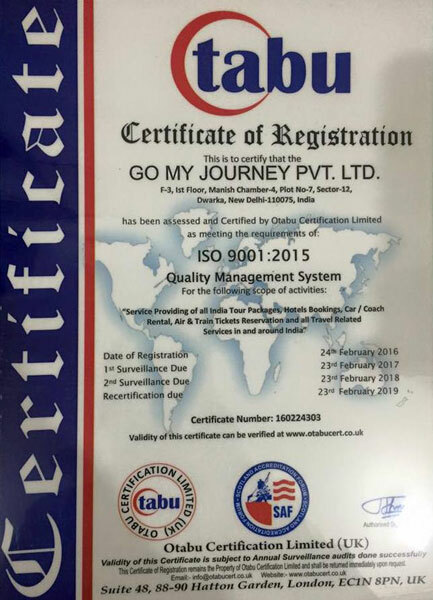 Go My Journey Pvt Ltd specializes in Inbound Tourism. Our team members are not only available 24 X 7 for pre-tour arrangements but once in India; a member is available throughout making sure all requirements are appropriately attended. Our sourcing team ensures that the rates for accommodation travel and allied services are comparable if not the lowest possible. Our expertise in handling large groups is exemplary. We have a team for liaison with tour operators abroad to customize tours as per our partner's and their guest's needs. Go My Journey Pvt Ltd Operators of Rajasthan Tour India suggests we invite great and treat our valuable guests in the traditional Rajasthan style. In the hospitality field like ours no one can expect any smallest task can be completed with perfection without the human touch. Team Go My Journey Pvt Ltd strives to give the personalized care and services to the valuable guests, because we feel our guest is our God. We are blessed with highly professional and experienced team, well equipped with latest information about global trends and minute changes taking place every now and then in the hospitality world. At Go My Journey, it is our motto to enchant guests with memorable experiences. One can choose a wide range of cities, hotels & resorts, packages and activities. Tour Packages are not only highly customizable but also best use of the money. Guestâ��s satisfaction is among the top listed priorities and we leave no stone unturned to accomplish this task at any time. Be your holiday plans, adventure sports, cool retreats, desert, eco-tourism, heritage trains, beaches, pilgrimages, royal retreats, medical & healthcare or wild life, we have something for everyone. That makes us really 'Incredible'. Be assured, we will make your journey of 'Incredible India' memorable.